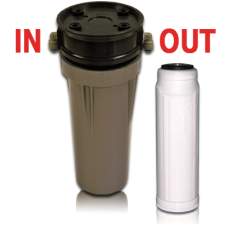 Intended for use outside of your water ionizer machine. Chloramines are comprised of compounds containing chlorine and nitrogen, which is naturally occurring in virtually all water at some level in the US. Free chlorine has been used for decades in municipal water treatment. It turns out that the combination of chlorine and organics in water can produce a new category of dangerous carcinogens called disinfectant by-products. After the serious adverse health effects of DBPs were discovered, the USEPA promulgated the Disinfectant By-Product Rule pertaining to the use of chlorine in drinking water. To reduce the concentration of Disinfectant by-Products in drinking water, the water industry began to use chloramines (chlorine and ammonia). By reducing the amount of chlorine and replacing it with ammonia, DBP levels dropped. More and more municipalities across the US are transitioning to chloramines in an effort to comply with EPA standards. Hospitals and kidney dialysis centers must be alerted when chloramines are used for water supply disinfection. Cases of chloramine-induced hemolytic anemia in patients have been reported when their dialysis water was not appropriately treated. Persons with liver or kidney disease and those with hereditary urea cycle disorders are at increased risk for ammonia toxicity from the consumption of chloraminated water and kidney dialysis patients cannot use chloraminated water in their dialysis machines because it will cause hemolytic anemia. Respiratory irritations as chloramine fumes can cause an individual to become congested and cause sneezing, sinus congestion, coughing, choking, wheezing, shortness of breath, and asthma. Chloramine exposure can also cause severe skin reactions: rashes, itching, welting, chapping, cracking, bleeding, dry skin, flaking, blistering, burning sensation, scarring, pigmentation. Chloramines can also aggravate other skin conditions such as eczema and psoriasis. Unlike chlorine, chloramines do not rapidly dissipate on standing, nor do they dissipate by boiling. Drawbacks to the use of chloramines can include potential water quality problems (e.g., nitrification and corrosion) if the treatment process is not carefully controlled and the system’s operational practices are not appropriately adjusted for the new disinfectant. Chloramine can change the chemical properties of the water, which can impact corrosion of lead and copper. While chloramination has been recommended by the EPA since the 1990s as a way to lower the level of carcinogenic disinfection byproducts (DBPs) created by chlorination, it has led to unintended consequences, in some cases making the water extremely toxic. Chloramines, like chlorine, are toxic to fish and amphibians at levels used for drinking water. How do I remove chloramine(s) from my drinking water? The most effective way to economically reduce chloramines is through the use of specially designed carbon (catalytic). 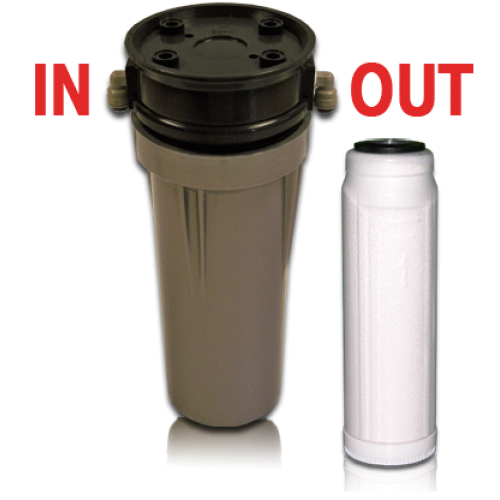 Our high capacity filter has been designed for up to 1,500 gallons of use.